A few meatier dividends for income investors to choose from. Procter & Gamble (NYSE:PG) is a true dividend aristocrat, boasting a payout that stretches over 60 years without a single pause in annual raises. That incredible streak is a testament to its dominant market position across a wide range of consumer goods categories. Income investors haven't had much to celebrate about the company's latest trends, though. The dividend ticked up by just 1% this year and by 3% last year. 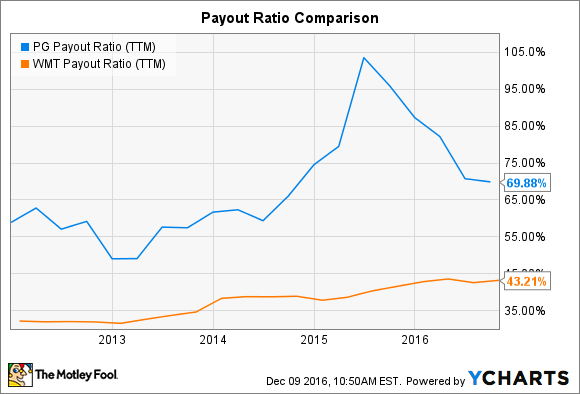 Meanwhile, its payout ratio is still perched above two-thirds of earnings, which implies slow growth in the dividend ahead. So today, I'm looking at a few stocks that investors might prefer over P&G right now. Last raise is the most recent percent change in the dividend. Data sources: Company financial filings and S&P Capital IQ data. Johnson & Johnson, like P&G, has struggled to produce sales gains in the consumer goods industry. Revenue in that segment declined last quarter despite healthy increases in the Listerine, Aveeno, and Imodium brands. However, the company's other health-focused divisions more than made up for that weakness. Pharmaceutical sales spiked 11%, and medical device revenue improved at a healthy 3% pace. Johnson & Johnson's pipeline for new drugs is looking strong, in part because the company dedicates almost $10 billion per year on research and development spending. CEO Alex Gorsky and his executive team believe that money will be well spent. They aim to deliver 10 new product launches by 2019 that are each worth over $1 billion of annual revenue. P&G, meanwhile, is on a bit of an innovation slump given that it hasn't launched a new $1 billion brand in over a decade. Wal-Mart's operating trends look a lot like P&G's lately in that sales growth has slowed to a crawl while earnings are down by double-digits. The retailer is pouring money into initiatives aimed at protecting its tiny customer traffic growth momentum, which has also pressured profits. Earnings haven't fallen nearly as much as P&G's, though, so its payout ratio remains comfortably below 50%, giving it more room to ramp up dividend hikes once sales growth finally returns. Wal-Mart's cash-generating strength also makes it preferable to P&G for income investors, in my view. Free cash flow improved by $5 billion through the first three quarters of fiscal 2017. Operating cash is up 38% since 2013, compared to an 8% boost for Procter & Gamble. Both companies aim to send shareholders huge piles of cash over the next few years. But in P&G's case, most of those returns will come in the form of stock repurchases, at least until its payout ratio falls back down toward 50%. Wal-Mart has more freedom to raise its dividend at a market-beating pace. 3M stock has the smallest yield in the group, but that's mostly because the conglomerate has outperformed the market by a hefty margin in 2016. Investors have at least one good reason to bid up its shares this year, even though sales growth hasn't been strong: profits. Net income is up 3% so far in 2016 thanks to broad improvements in profitability that pave the way for more market-beating dividend growth ahead. 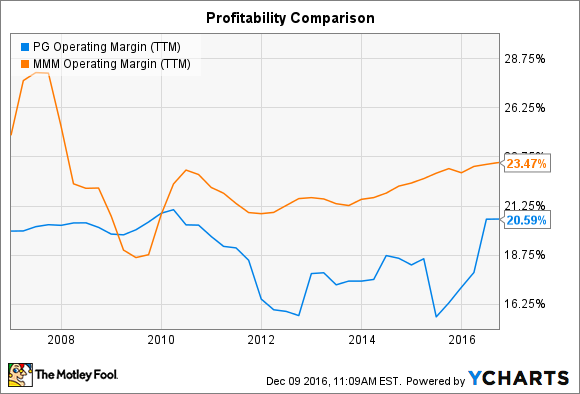 It matches up particularly well against P&G in the margin arena, where 3M has maintained above-20% margins through good and bad industry cycles as the consumer goods specialist endured wider swings and lower overall profitability. Combined with its lower payout ratio, 3M's strong profit position should help keep its dividend growth pace above P&G's for the next several fiscal years. Each of these three dividend stocks has its own set of risks and weaknesses. Judged simply for their fitness in generating income growth, though, 3M, Wal-Mart, and Johnson & Johnson seem better positioned than P&G to reward shareholders with bigger quarterly payouts over time.